Never in my life I have been offered as much chewing gum as in Ethiopia. Admittedly, street vendors wanted to sell me other things as well: fake gems, guided tours and colorful baskets the size of a small elephant. But above all, they sold gum. Some people had a more intricate plan to gain access to my money. Piedro introduced himself to me in Addis Abeba, the country’s capital. Could he please practice his English? So I asked about his age (probably 16, but he’s not sure), his background (a refugee from Eritrea) and his family (he’s an orphan). Then Piedro invited me to a party where everyone would be dressed in folk costumes. I declined politely: invitations of this type are a well-known way to get robbed. Like me, most westerners visit Ethiopia on behalf of a development organization. They bring financial and human capital to help fight poverty, diminish hunger and improve health. Subsequently, many Ethiopians have come to confuse westerners with a walking dollar sign. This seemed to stand in the way of acquiring what Mark Twain called the “broad, wholesome and charitable views of men and things” that I usually get in a different country. Only with the medical doctors I met for work I could actually talk about matters beyond money like religion, food and relationships. I was brooding on this when I was boarding my plane back home with 17 young Americans. They turned out to be missionaries who had spent six weeks in a remote part of Ethiopia. Assuming they volunteered for an organization, I asked what kind of development work they had done. Nothing, they replied: their sole aim had been to spread the gospel. When a local man bitten by a snake came to them for help, the only thing they offered him was prayer. Looking at the munching missionaries, I realized I now knew who buys all that gum in Ethiopia. I also understood my trip had been a success. For most Ethiopians, I might be just another rich westerner but for sixty medical doctors and their patients, my visit had made a difference. 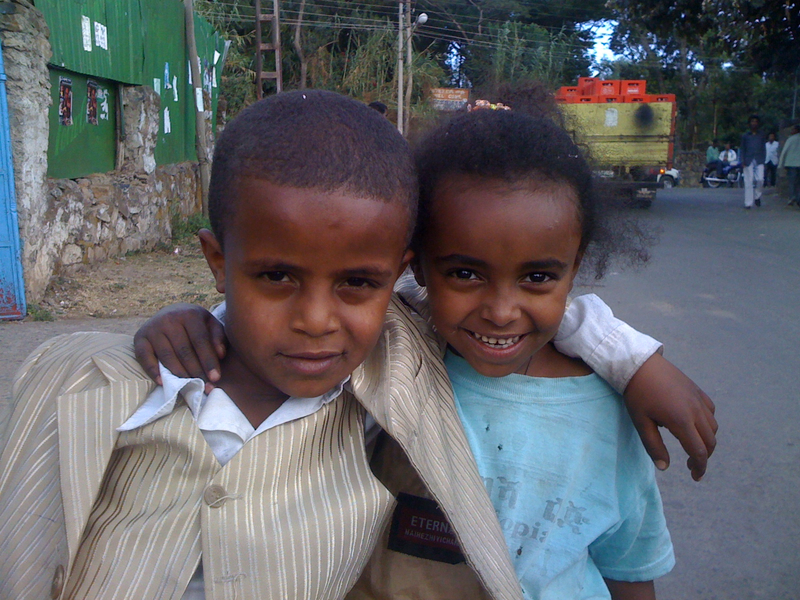 Two five-year-olds in Gondar, Ethiopia, who insisted on being photographed and giggled incessantly when they saw the result.